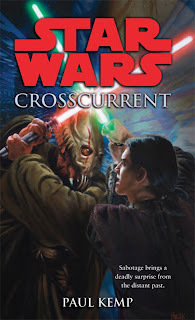 Just a reminder that Stomping on Yeti spotlight author Paul S. Kemp's Star Wars debut, Crosscurrent comes out today. Whether or not you've read Star Wars fiction before, this is a book I would recommend. It's enjoyment-heavy and continuity-light. And I know you've at least seen Star Wars. No one who reads this blog who hasn't seen at least the first one. If you haven't get out, now. Come back when you are human. I'm promoting this one, not only because I loved the story (full review here), but because I realize many publishers only see through their bottom lines. And the better this book does, the better the odds that I get more books like it. Which is something I want very much. So checkout Crosscurrent and give it a try. It's like reading the movies. Or at least like reading the good ones.